This entry was posted in DE and tagged nachrichten on July 31, 2013 by FEMEN. This entry was posted in RU and tagged новости on July 31, 2013 by FEMEN. This entry was posted in TR and tagged haber on July 31, 2013 by FEMEN. Μια κίνηση α λα "Femen"
This entry was posted in GR and tagged ειδήσεις on July 31, 2013 by FEMEN. This entry was posted in ES and tagged noticias on July 31, 2013 by FEMEN. This entry was posted in FR and tagged nouvelles on July 31, 2013 by FEMEN. 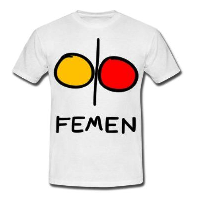 This entry was posted in TR and tagged haber on July 30, 2013 by FEMEN.